I'm trying to find the word for this kind of hairdo. It was fashionable during the 60's and several movie stars adopted that look on one occasion or another. Jane Fonda was one of them. I think. Usually around five inches tall, sometimes these hairdos would reah ten inches! I'm trying to describe a relative of mine in an old wedding picture, and would appreciate any help. This hairdo is called a beehive. 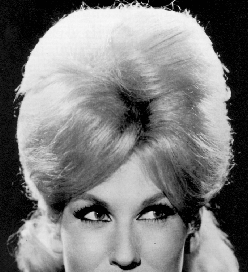 Although there is sometimes hair hanging at the side of the head, this style differs from a bouffant in that the hair at the side of the head does not also attempt to have increased volume. It draws this lower hair style from the pageboy. It originated as one of a variety of elaborately teased and lacquered versions of "big hair" that developed from earlier pageboy and bouffant styles. The Beehive is a woman's hairstyle in which long hair is piled up in a conical shape on the top of the head and slightly backwards pointing, giving some resemblance to the shape of a traditional beehive. Google Images has quite a few examples of beehives. Not the answer you're looking for? Browse other questions tagged image-identification or ask your own question. Is there a specific name for this kind of water dispenser? Is there a name for a 3D snow globe? What's the name of this kind of workers and of this equipment? What is the name for this feather-like material coming out of this wire? Is there any single name for this type of sport which look like exercise? What is the single name for this thing? What is the single name for this switch thing? What is the name of this thing shown in “Call Me By Your Name” movie?